Cornwall, Prince Edward Island – I wake to a misty morning, determined to get a bike ride in for some exercise. I pick out the destination of Blockhouse Point Lighthouse and head off into the cool morning. PEI is expanding their tourism push to include bikers but the roads leave a little to be desired. Generally, some of the locals seem to prefer people who take the bike paths and I find myself being quite aggressive on the road in areas with no shoulder – which is most of the road. 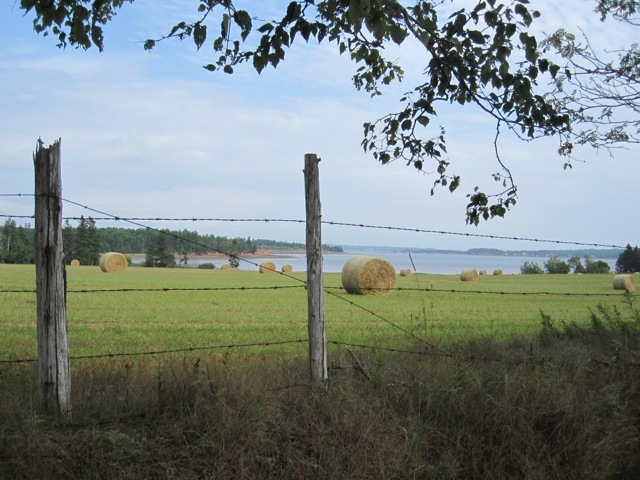 The countryside is beautiful with red dirt and huge fields of potatoes ending in the ocean. Over every hill, little ponds nestle in the divots, the domain of ducks and geese. I am having a hard time deciphering Canada’s signage since national historical sites and local business attractions are listed on the same blue signs – plus the arrows on the signs point where you should go and how far but occasionally without a road. The sign indicating the lighthouses pointed left and said 1km. I couldn’t tell if that meant to turn in 1km or turn at the road immediately to the left. I kept going down one huge hill and felt I was in the wrong place. I turned around, went down the road I’d missed. The paved road either ended into a red dirt road or turned left to Fort Amherst, the site where, in the 1700’s, the British deported a French colony of almost 10,000 people. Some of these French resettled in Louisiana and gave rise to Cajun culture near New Orleans (the subject of a later, more southern road-trip). Many, however, died on the trip back to France. I rode my bike down the dirt road, wanting to see the lighthouse, not the historic site, but it seemed again I’d taken a wrong turn. I turned around and went back half-a-mile to the historic site, took a few photos and found out the lighthouse was indeed down the dirt road. Back down the dirt road again, I finally found the BlockhousePoint Lighthouse and had it all to myself. 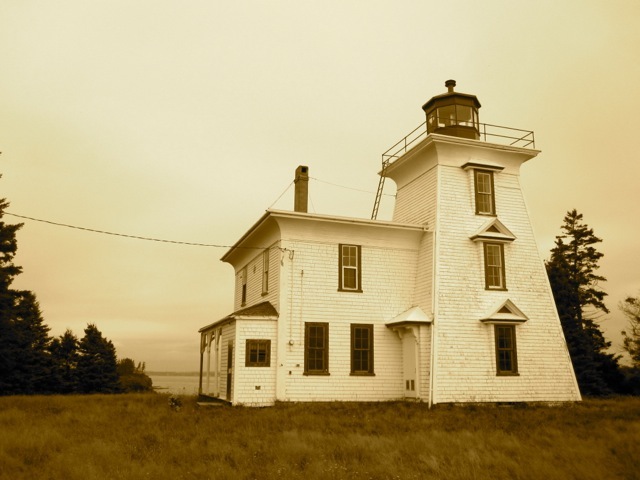 This lighthouse is PEI’s second oldest and sits on the edge of a small cliff ending in flat red boulders and the sea. Having a lighthouse to yourself is a special thing. Finding my way back to the campground was simple, aided by a break in the clouds and a terrific tailwind. “Are you a nurse?” a man in the campground said to me as I headed to the showers. He pulled up his pant-leg to show me a very swollen ankle. Let me add that I talk about twice as fast as anyone from Prince Edward Island. Little Joe later invited me over for tea. He was a woodsman and one of those guys who could do anything. His father died before Joe could take over the farm so his mom sold the acreage for a pittance and Joe moved to Ontario where he worked as a milker on an uncle’s dairy. Back in the day, dairies would provide room and some board to their milkers. These men and sometimes women knew animal care and husbandry from truly first-hand experience and, like Joe, pursued knowledge of a hard-and-fast school. Book-knowledge was not their lot. Instead they worked hard. Joe knew everything about cows and had lived through some tough times being a laborer. “You’ve seen worse than this, huh?” I said to him. He threw the ball for his Shih Tzu, Cuddles, whom he’d trained to retrieve like a Labrador. She easily entertained all the campground kids at once. He elevated his foot a ways to make me happy and proceeded to tell me a story about a round-bale falling on him while he sat in a tractor, stopped only by the fenders on either side of his seat and the fact that the bale fortunately landed on the flat side. The bale flattened him for an hour. I asked what he did under the bale. He reminded me that they weigh a ton and said he just waited for help to come but thought he was good as dead. Finally the farmer came and retrieved some boys from a neighboring farm to push the bale off his back. The farmer took him to the ER where they verified nothing was broken and sent him home. “You traveling by yourself?” he asked. I wondered how far I could go into self-reflection and commented that the island looked a lot like Ebey’s Prairie where I was from. This was sufficient. I held a question back but Joe prodded me about my business in Denver. I didn’t know quite what to tell him so I told him I was going back to school to learn to be a social worker. “Me wife takes care of old people.” It’s hard to describe Joe’s accent but sometimes it reminded me of a pirate. Often I had to ask him to repeat himself. It turns out his wife is a caregiver at a skilled nursing facility. I asked him how they met and he said she was younger and he was a “bad boy” getting drunk all the time. She told him at a dance one night to take her home and then join her family for church the next morning. He took her home and then pulled over to sleep in a field. They were married after they tried out having kids together. After their first one, they married and had been together ever since. In fact, they lived two miles down the road and he would be sure to show me in case I ever wanted to stay at his house. 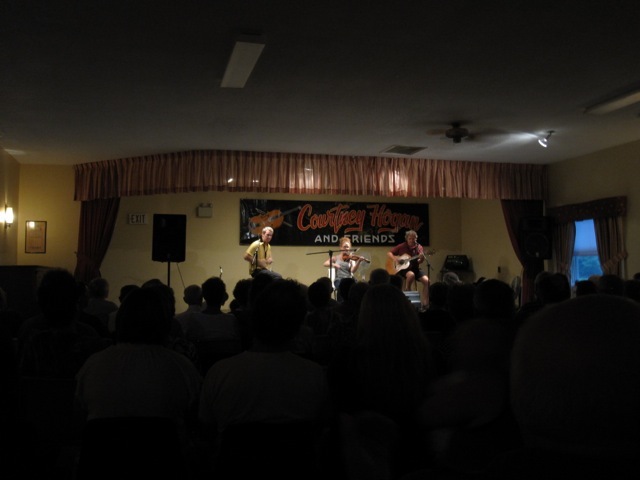 I mentioned that I’d rode past a sign for a ceiladh that night at Afton Community Centre. Joe knew the place, in fact they’d had a party there for their last anniversary. The conversation wrapped its way back to school just as Joanne pulled into the campground. I asked Joe how much school he’d completed. We’d talked for two hours about everything. “I think I was done about fourth grade,” he said. I already knew he had no desire for sympathy. Life is what it is to Joe and being that they owned their house, he was proud of where he was in the world. He chatted a little about everyone moving to the island, mostly Chinese according to him. It was different now that there was a bridge. Joanne wasn’t the least bit phased that I was sitting in their trailer. “You see, we’re not jealous. Never been jealous. That’s the key to us.” He told me. Joanne nodded her blond head and I blurted, “Will you go to the ceiladh with me tonight?” She agreed since Joe didn’t like those kinds of things, especially with his foot so swollen. Two hours later I jumped in her car and we drove the windy roads to Afton Community Centre just in time. Courtney Hogan was the fiddler and over 100 people, mostly 60-plus years old, sat in folding chairs back from the stage. She was joined by a guitarist and a sax player also from the island. Taking up her bow, she stomped her foot and the music, oh the music, started. Her fingers were like flitting birds as she took the first song into a jig and soon a woman whom I later found out was 85-years old, jumped out of the chair to jig. The music, the tradition of it all, made me tear up as I cheered. The saxophone player put down his instrument and grabbed two spoons from below his chair. He clattered them together adding percussion. “Now how’d you like to see some stepping?” Courtney asked after the first song and a blond wisp of a girl jumped on stage in steel-bottomed shoes. The music started again faster and the girl started stomping a rhythm with her feet, holding her body ramrod-straight. She high-stepped and clicked her heels together off to each side, then folded her hands and turned them backward to the crowd like it was no big deal, faster and faster. She flipped her head back to get the hair out of her face, stomp, stomp, stomp and was done. The crowd gave her all their appreciation. Later I found out her mother, so proud, was from Cape Breton Island and had been a dancer too. The girl and her sister won the equivalent of “Prince Edward Island has Talent” and were headed to nationals soon. They gave me permission to post a video of their stepping online but I had been jumping up and down too much for the first dance to record any good footage. Later in the evening, I made myself hold still for just one song. The woman next to me was 89 and grew up on the island, even went to a one-room schoolhouse. At intermission, we ate biscuits baked by Courtney’s mom and nana along with homemade strawberry jam. On the ride home, Joanne said that’d been a fun night. I wholeheartedly agreed, holding onto the door as she whipped around curves in the dark. The next morning, Joe used an old-fashioned electric toaster to make me peanut butter toast. We drank one last cup of tea before Joanne wrote down their address and email – “I don’t know if you use email, but here’s mine,” she said. Joe hobbled to his truck and pulled out a picture frame holding a certificate and some coins. “Now I want to show you something. I’ve only ever received two certificates in my life. Look at this.” He holds out the frame and I read a certificate stating that Joe has been clean and sober for a very long time. I congratulate him, really tell him good job and he’s so proud he gives me a hug as we say goodbye. I promise to write, knowing Joanne will read him my letters and wave goodbye to catch the ferry to Nova Scotia. I like Joe. Reminds me of my friend Daniel.